Yakuaya means "the essence of water" in Quechua. The film is a nonverbal documentary that is about the value of water as essential to life. The documentary follows the journey of a drop of water, which originates in a glacier, and eventually reaches the sea. On its way it touches the lives of a peasant, it is enclosed in the rhythm of a water bottling factory, it transforms the life of a woman, it awakens hope in a desert and welcomes the innocence of two children in the sea, among other adventures. This visually engaging film, whose aim is to inspire reflection in its audience, premiered at the Ecuador Film Festival and screened recently at the Guadalajara International Film Festival. Marcelo Castillo has worked independently as film director and still photographer for nine years, during which time he's directed a myriad of short films and photography series. 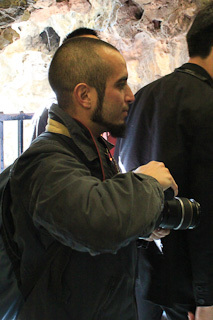 In addition to his work in the audiovisual field, he has conducted several projects on social and community life.